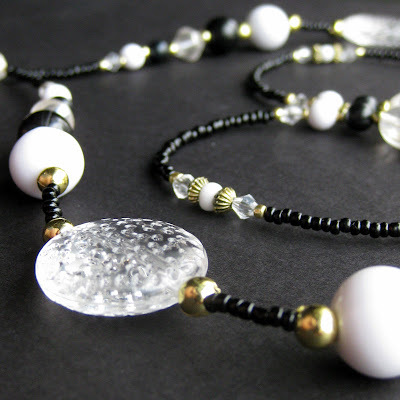 Ice-like stippled beads shimmer on this beaded badge lanyard of black and white with just a hint of gold for warmth. So many people now need to wear lanyards. It isn't just latch key kids and nurses who wear them anymore but teachers, students, interns, office workers, security staff, lab workers and many more. This beaded badge lanyard is completed with a 1cm split-ring to securely hold a badge, keys and many other light-weight options while the nape of the strand is created to be comfortable against the back of the neck with decorative beads further down along the strand so they are shown off to their best advantage. Although this 36" (91.5 cm) lanyard is made with a sturdy no-clasp design for added security, it can also be adjusted to include an easy magnetic break-away clasp if needed.